Compatible for 8, 9, 10, 11 and 12 speed. If I had it to do over again, I may have gone with a 2 x 10 rather than 1 X 11 for a wider gear range. I do like the lighter weight and ease of use of the 1 x 11. I definitely would not go with a 1 x 10. As it is I went with a 28 tooth rather than the 30 tooth recommended by the bike manufacturer. Even with that I would like a taller granny gear. So I may get a 26 tooth for big climbing days. I am getting back into mountain biking after taking some year off so hopefully fitness will improve and allow me to go back to a 28 or 30 tooth for fast down hills. All that said the Race Face cinch with this gear system appears to be as good as the carbon XO at about 1/2 the price. Bought a 28T in case I need to give me legs a break. I have Race Face Cinch 30T Chain Rings on my other bikes, bought the 28T in case I needed a break. The Cinch system is brilliant. No more lost chain ring bolts! just recently got back to Mountain Biking and am amazed on the advancement of components. after installing and using the cinch chain single chain ring. I am sold on this product. the shifting is crisp and no more drop chains. Perfect. As described and expected. The product description on JensonUSA web site was accurate. The delivery was prompt. Swapped my original 30T for this 26T on my 1x11 (fat bike) as it is very hilly where I normally ride. The lower gearing makes a significant difference both on all those up hills and in the snow. Cinch system is very easy to work with and I definitely recommend it. Great product, it fit perfect and was exactly what I needed. Light, tough, looks great! Fast shipping. Wouldn't buy from anywhere else. Fit and quality are great. Cinch is exactly that - a cinch to install. Replacement for the existing ring that came on the bike. Has been a great part, but after 5 chains it started to drop the chain on rougher descents so it was time to replace. Has worked great for me. Good chain retention and easy installation. Nice and easy to install. Looks good and retains the chain well. Went down to a 32 from a 34 and it seemed like the right choice for me. Just a slightly better gearing range on the steep while still forcing you to maintain some pace. What to say? This chainring rocks, it goes on easily, is great quality, lasts forever and it looks great! Race Face got it right! This is the third Race Face Cinch Chainring that I buy. It works incredible and has a great performance. Like changing tires on a NASCAR. Have this currently mounted on my RF Next SL cranks. I also have a 28t and 32t. Easy to swap when necessary. Purchased this 30T chainring to swap out a 28T on my fat bike. It was easy to mount, fit great and gave me the slightly taller gearing I was looking for. JensonUSA really has the best prices out there! I got this chainring for $28!!! My local bike shop actually recommended I shop Jenson because they can't compete. Was going to pay $65, until l found it for $28 on Jenson. Same exact product, and it rides great. Highly recommended! Great high quality parts and super great returns if you're not happy! These chain rings are very durable and last longer than competitors- now my goto cog. Cinch setup is a quick and easy repair/maintenance system. Love my new blue chain ring. The only way to go, Raceface Cinch. 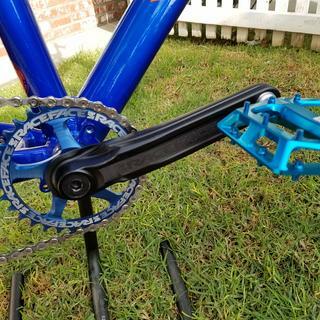 Wanted a blue chainring to sorta match my bike, and being that I have Raceface Affect cranks, this was a logical choice. I got the 32 tooth for my 1X11. Fit and finish on the chainring is really nice. Changing a chainring is a snap with the cinch type. With the narrow wide ring, the chain rides straight, and fairly quiet. 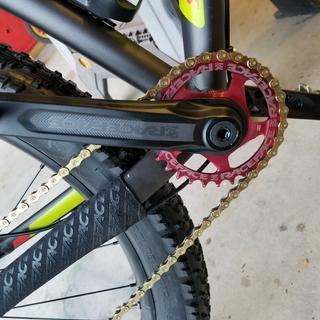 Very happy with mine, I'm glad Raceface offers these chain rings in different colors. I bought this to replace an existing chain ring that I bent a tooth on in the middle of the ride. I absolutely smashed the bejesus out of it on a concrete drain pipe and it only bent 1 tooth a small bit. I was able to bend it back and continue my ride. I've had ~20 more hours on the ring since then, without issue. I bought this just as a backup incase I start having any drivetrain wear issues down the road. Highly recommended. The cinch system is super easy to install. I just got this installed yesterday as it arrived earlier than expected. 20 mile ride this morning on pavement and it worked flawless, super quiet and smooth. Did a bunch of bunny hops and tried jolting it around and the chain seems to stay put. Also like the clean looking install of the cinch system.. Would recommend. These Cinch rings are light weight, reliable and easy to change out quickly. I have a few in different sizes based on the terrain that I'm riding that day. Purchased to increase the stock 30t to 34t. Does the job perfectly - the chain isn’t dropping. Requires a BB tool to install. Just what I ordered. It was a great sale. I have not tried it yet, but my drive train is almost worn out and will have to purchase a cassette as well. I was previously running a 30t sprocket and dripped all the way to a 24t. The difference in ratio basically dropped my lowest gear two places! I can climb anything now. Quick, easy service, and accessible customer service...refer family and friends to site when ever possible. Also won a set of mtn bike gloves at sea otter last year. Thanks for having my back! Anyone thinking of the 1x switch, don't hesitate. Super simple install and narrow/wide works exactly as advertised. Great chain r etention and quiet. Been riding race face for years. One of my best sponsors. Cinch is awesome. Easy to install and quality lasts. Narrow wide tech keeps chain from dropping even without a clutch derailleur. Easy to swap, chain stays in place, light and pretty durable. Nice cinch chainring, great for the price bit they do wear quickly. Makes climbing easy with my 9-46 E Thirten cassette! This fit my Race Face Next R Cranks. Race Face Chainring is pretty dope. Hooksup with my chain. Not much else to say. It really helps me crush all the mountains in Houston!! Went Eagle with a RF Next SL G4 crank. Worked perfectly. Except I think I need a 34T instead of the 32T I bought. Love theses rings never have chain drops. I needed a 32 tooth and they were a great price. Nice looking product, really fast shipping and it looks sharp on my bike. What's the difference between this race face cinch chain ring and the CG179A00 ring... the description doesnt clarify why its 40$ more? BEST ANSWER: Not sure if this helps, but the only two criteria for my purchase of these Race Face chainrings is the # of teeth and spline compatibility with my Race Face G4 carbon cinch crank. The mod# of the one I just bought is RRSNDM32BLK. 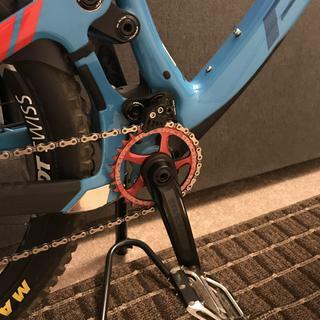 BEST ANSWER: Agreed with Tzuk; Chainring doesn't have anything to do with Boost; But I suppose if I had to answer your question I would say yes it is compatible with boost (as I'm running boost). It also is compatible with all handlebars. The chainring doesnt really have much to do with boost hub spacing. The chainline will be fine for boost or 142. So yes boost compatible. The chainring offset affects the chainline (Wolf Tooth has a very good article on this) so yes it does have to do with boost hub spacing. That is why many brands offer boost and non-boost chainrings. Some boost frames work with a non-boost chainring; others require a boost chainring. I believe most plus bikes with boost require a boost chainring. I'm using this on a 2016 Trek stache with 148mm boost spacing. So yes it works with boost. Yup,as it was explained well earlier. It also worked great with my boost setup. How many MM offset is this ring? is it compatible with sram eagle? BEST ANSWER: It will work with a race face crank, which is technically eagle compatible. No. This is for Race Face Cinch Mount. You need a SRAM Direct Mount compatible chainring. SRAM uses a fairly distinctive mount with 3 screw holes. Is this compatible with SRAM NX?? BEST ANSWER: No, this uses the Race Face mount. For SRAM cranksets, you need a chainring with the SRAM Direct Mount interface pattern. SRAM has a fairly distinctive mounting pattern with 3 screws to hold the chainring in place. Is this compatible with sram NX??? BEST ANSWER: I've heard that it is, but I have only used it with GX personally. Hello, does this fit my Santacruz Bronson C S 2016? It has Race Face Aeffect SL cranks. Thanks! BEST ANSWER: Yes it will fit that crank. As for max chainring size, that is not determined by crank, but by chainstay clearance. I have used 34T rings on multiple SC models, and have never seen or heard of a frame from Santa Cruz, or any other manufacturer, that would not accept rings in the 30-34T range. Yes, I recently installed one of these on a bike equipped with aeffect cranks. I have same crank on my Hightower. Largest ring that will fit is a 32t. It fit my Trek Farley with a Race Face Aeffect. 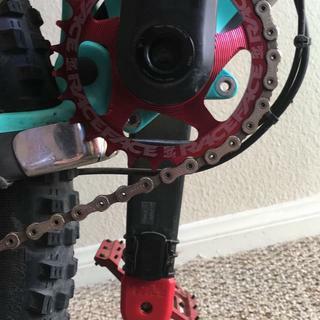 If I replace an Aeffect 32T ring with a 30T ring, should I adjust chain length at all? BEST ANSWER: You should not have to. BEST ANSWER: Any of the Race Face cinch cranks, or anything else that says it takes cinch chain rings. If I move from a 28t to a 32t do I need to adjust chain length?